We can now clearly see, in the highest tier, in a practical environment, just how worse Arcane is compared to Fire... So to all of you saying you can do comparable DPS to a good fire mage as an arcane mage, can you please provide logs that prove it because once more the numbers are saying that Fire is vastly superior. Thanks for posting this here. Great to see involvement from everyone. For the Arcane players, don't be discouraged. If you want to play, go for it, but you can now clearly see just how much worse Arcane is, further to the discussion of Fire vs. Arcane before. Well the evidence is in, I'm fine with not beating fire... well in most cases I still will because the herd of sheep that go for only the top dps spec are bad at getting to that top spot so the only people that will trump me as fire are people who are just generally better players than me. The most satisfying thing on this whole thread? That image showing assassination destroying outlaw (the current sheep spec for rogues). So yeah, I was probably wrong, but as you can see not even the best sims will prove that the predominant no-cons (from a guide on here, not my words) spec is going to top other specs when it comes down to real player controlled fights and up to date content. I'll keep playing Arcane and enjoying it and most likely still getting grief in mythics because I'm not fire but eh, best I can do is to keep playing the spec to the best of my ability even if this guide wants me to roll fire. That's all good, fair enough. I'm not here to tell you what to play, merely what performs best and I'm sure you can understand that. Wait a second, so because the image shows Arcane near the bottom everything this guide has shown is absolutely true, but because assassination is above outlaw it's fiction? I feel like there's a logical fallacy. The reason Assassination is ranked so high is because there is a TINY pool of people playing the spec. That's why what you posted shouldn't be blindly followed.. Please actually look for a second at what I just posted you. Out of the top 10 damage per boss, there are times where Outlaw is 10/10 for top dps. Did you just not look at what I posted at all? I did but that's a player pool of 70 compared to a pool of 140k parses. Look at Arcane and Frost, we're tiny as well with our player bases but down at the bottom of the rankings and I was going at it as hard as I could for my one little data point of Arcane and we just simply lost. I feel like you're upset, I'm not trying to be rude, I apologize if I'm causing undue frustration. I just feel insulted when one data disproves me but is completely invalid for other specs. OK, perhaps I'm wording this wrong. Let's try this a different way, using something that the others don't seem to like, but perhaps you will. Maths. 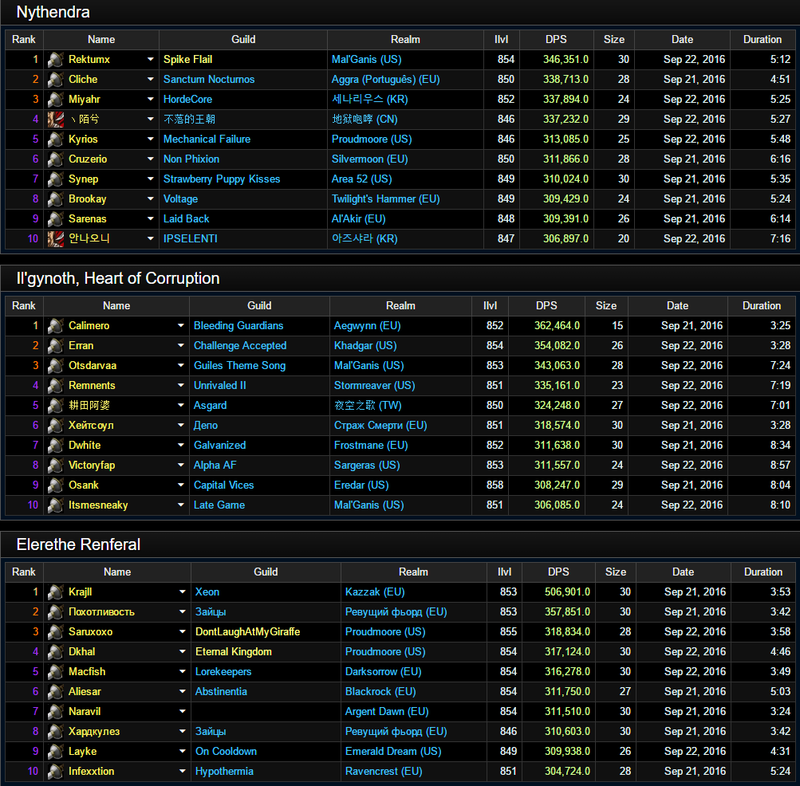 Let's take what we have here in our rogue parses for Nythendra. ASSASSINATION: 559 parses at the time of me writing this. There are 2 assass rogues in the top 10 for Nythendra. 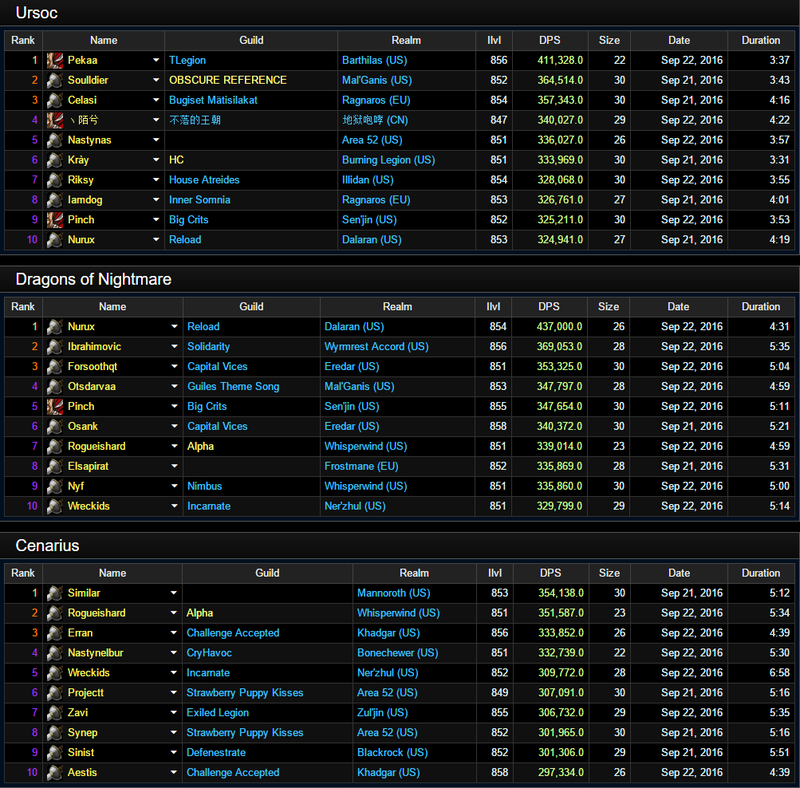 The top Assass parse is 337,232. OUTLAW: 2769 parses at the time of me writing this. There are 8 Outlaw rogues in the top 10. The top Outlaw parse is 346,351. Now, the graph you linked shows the 75th percentile for each spec. Using simple maths, we just need to find what the 75th percentile is for each spec. This means that the DPS displayed is by the user in 692nd-693rd place. These are 225,211 and 225,126 respectively. This means that the DPS displayed is by the user in 139-140th place. These are 231,528 and 231,409 respectively. Now, the graph you linked shows the 75th percentile for each spec. It wasn't Guest NotConvinced that posted the graph. I also feel this thread has gone -wildly- off topic considering how strictly moderated the guide comment sections are, with everything not relevant to the guide usually asked to be taken to the other subforums. I meant to say referenced, not linked, sorry. Simple mixup of words! I agree. I'll be transferring everything to another thread in the general discussion forum. Shoutout to Blainie for moving the discussion here rather than messing up the guide comment section further. For those just joining us, there's been a sometimes heated debate regarding Arcane's DPS right now - disagreements over stat priorities and how it compares to fire. While the evidence is very stacked towards Vers being the best stat and Mastery, which theoretically -should- be good, being rather bad there are several people claiming otherwise. Several people are claiming they are doing more damage with high Mastery, though no hard evidence has been presented. Why would u care if your doing more dps than a arcane mage...if your killing bosses then thats what important. Play the spec and class u want and dont compare urself to others. Be happy with playing and stop trying to put down others and their choices...ur seriously nnot that epic fellow. Who was this even aimed at? It was aimed at the person that started the thread. He was posting it due to numerous people saying they were constantly outdpsing Fire Mages in their raids as Arcane. I don't think he was trying to show off at all or put people down, he was simply showing the percentiles after people were saying Arcane > Fire. It's also been taken quite out of context since we had literal pages of arguements in the Arcane Guide Comment's thread and this was moved out of it to here. It was an attempt to show more factual proof to the people claiming Arcane was better than Fire and the sims were wrong. I'm sorry you got the wrong end of the stick. Pretty much what Brutalis said, yeah.